How old should charity trustees be? I commented on an interesting blog post about young charity trustees a few weeks ago. By chance, I came across the post again today, and noticed that my comment wasn’t there – presumably swallowed by spam filters as it had quite a few links in it. The age of charity trustees is a topic which comes up from time to time, particularly amongst those of us who work in youth volunteering charities. For readers from the corporate world, it’s perhaps worth some quick background about trustees. The best analogy for a charity trustee is company director. As with companies, many charities (including my own) employ full-time staff, whose job and career it is to work for. We also employ a full time manager – in our case, a ‘Chief Officer’, who is responsible for running the organisation. In all operational respects, they are in charge. Trustees are similar to company directors (except that we don’t get paid!). In the same way that corporate CEOs have to answer to a board of directors, a charity Chief Officer is responsible to a board of trustees. The trustees are responsible for strategy, for long-term planning, for direction. The trustees define where they want the organisation to go in broad terms, while it is the staff under the direction of a manager or Chief Officer who put in the hard work to make it actually happen. Another analogy from my experience are schools. The headteacher is the boss for the day-to-day running of a school, but they have to answer to a board of governors, who are responsible for framing policy and setting direction. So the question that the original blog post was looking at was about who is suitable for such a role. Someone who can look at the big picture. Someone who can help create a vision for how the organisation could be, and help define the strategy and direction necessary to make that a reality. Someone mature enough to be responsible for the many legal obligations that come with trusteeship, such as responsibility for the finances. And in particular, how old do you need to be to be suitable for such a position? I wrote a quick post on Sunday morning about the mobile location sharing hack I wrote at Open Hack London. My post tried to explain the tech behind it, but I wanted to follow it up with a post to explain my thinking around the social innovation in the idea. Sharing your location with your friends. People have been talking about this for ages, but recently it’s started to hit the mainstream. More and more mobile phones are coming with GPS. For the ones that don’t, systems like Skyhook and Google Maps for Mobile are getting smarter at using GSM Cell IDs and WiFi access point addresses to work out where you are. The reaction to this stuff finally arriving for the masses hasn’t all been positive, though. 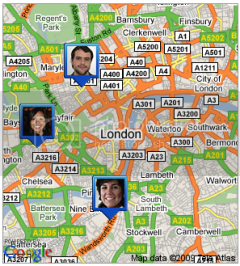 The response to the UK launch of Google Latitude – Google’s mobile application for sharing your location with friends from your Google contact list – is a good example. Privacy International said that “…Google has created an unnecessary danger to the privacy and security of users…”. They argued that it was too easy for Latitude to be “…enabled by a second party without a userâ€™s knowledge or consent…” and that once enabled it could remain undetected for a long time, with massive potential for abuse. 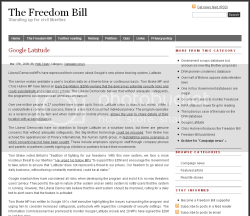 Liberal Democrat MPs Tom Brake and my local MP Chris Huhne submitted an Early Day Motion to Parliament arguing that Latitude “…could substantially endanger user privacy…” and that “…Google has created an unnecessary danger to user privacy…”. Tom Brake followed this up with the now widely reported quote that “Google Latitude poses an insidious threat to our hard-won liberties“. I personally think this was unnecessarily alarmist, but at any rate, it is clear that the model of granting ongoing access to your location (until / unless you revoke it) worries some people. Imagine you are in a town or city. Perhaps one which you are unfamiliar with. You’ve arranged to meet someone, and want to help them find you. They’re not a close friend or family member, so you don’t want to sign up with something like Google Latitude which feels like quite a long-term thing for people who want to always be able to see where you are. You don’t want to have to ask them to sign up for some new service like Fire Eagle just to find you. Maybe they’re a client coming to meet you for a meeting. You want to help them find you, but you’re not sure that you want them to be able to see where you go after the meeting, or what pub you go to that evening. This is the sort of thing that “Fire Eagle Guest Pass” – my hack entry for Open Hack London 2009 – was written for.